How delightfully strange that a Canadian author and illustrator would create a picture book about the American painter Grant Wood. 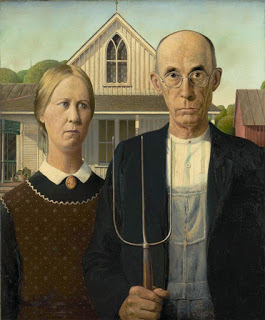 It’s doubtful that young readers, regardless of their nationality, will have heard of Grant Wood, and as a subject matter, the artist famous for the dour portrait of a farm couple and their pitchfork is, to say the least, an unusual choice. However, Grant and Tillie Go Walking works because author Monica Kulling and illustrator Sydney Smith have found a way to tell a fictional story that is suggestive of the life and artistic legacy of Grant Wood but still recognizably biographical. In melding fact and fiction, the story takes off, becomes its own thing – reverent but also charmingly re-imagined as the story of a man who takes the long way around to find what truly matters, and a cow who knew it all along. Grant and Tillie Go Walking is about two characters – an artist (Grant) and his cow, Tillie. Grant is a restless soul, disenchanted with the pastoral landscapes and quiet lifestyle of his family’s Iowa farm. He longs to paint like the French artists in Paris, and so abandons the farm and Tillie for the City of Lights. Tillie is inconsolable (as only cows can be in children’s books), giving little milk and refusing to go for walks without her best pal, in spite of the tender care of Grant’s mother. On the other side of the world, Grant adopts the lifestyle of the French painters and even dons a beret, but it is an invention – convincing no one, especially the French who are dismissive of Grant’s depictions of rural America. His dreams of home reveal a truth that is undeniable. In actuality, Grant Wood visited Europe four times over a period of years, but like the character in the book, he returns to Iowa to paint what is authentically meaningful to him – the American landscape. As an artist, Wood was inextricably shaped and inspired by his mid-west experiences. 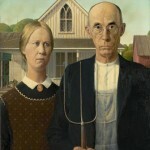 His very personal and unique style of painting is emblematic of an American art movement known as Regionalism, and his painting, American Gothic (depicted in the book), would become as internationally revered and recognizable as the masterpieces he studied in Europe. Grant and Tillie Go Walking is a gentle and beautifully realized portrait of an artist in formation. The old adage, write (or paint) what you know is an obvious motif, but running parallel is a story about bonding and connection – with the land, with wherever you call home, and with the person you truly are. And if you’re lucky enough to have one, your cow. Kudos to Monica Kulling and Sydney Smith for creating a picture book for children about this artist, or any artist. 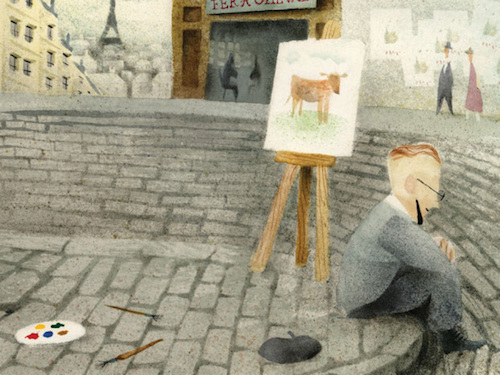 While illustrated picture books introduce art to children indirectly as a 32 page work of art, books about art and artists for children are rare. Fictionalized accounts even rarer. How do you walk that line between biography and fiction? Sydney Smith’s illustrations in Grant and Tillie Go Walking are an homage to Grant Wood but still stylistically original. Even more surprising is how much they differ from his previous book, the exquisite Sidewalk Flowers, which draws from the graphic novel sensibility of dark outlines and a palette of primary colours. 32Pages: In the publication notes, it states that you used watercolour, ink, and a toothbrush to create the illustrations. Can you talk about the process? SS: I used mostly a stenciling method for this book. I would draw the various shapes on bristol board and cut them out using the positive and negative as masking for application of watercolour or ink. The toothbrush was for the splatter. I have used a similar approach before digitally and thought that the effect would work well in this case because the result could have a similarity to Grant Wood’s style of painting. His hills and trees were so rounded and rich. The non-digital approach is much messier. I am still finding small paint-splattered cutouts of cows and houses in my studio! 32Pages: How do you decide on style for a particular book? SS: The hardest part of Grant and Tillie was deciding the approach. I had just finished Sidewalk Flowers but it didn’t feel right to do the same thing. The dark shadows and thick ink lines made sense for the city but in Grant Wood’s rural Iowa the images needed to be softer and reflecting his own style of painting. 32Pages: Were you familiar with the work of Grant Wood before you started this project? SS: Like most people, I was familiar with American Gothic and I recognized a few other paintings of his but I wasn’t familiar with his story. He found his Regionalist style after experimenting with other styles that were popular at the time and I can relate to that. Also, moving to a big city and being overwhelmed, that’s something I can relate to as well. 32Pages: Was creating Grant and Tillie Go Walking an enjoyable experience? SS: The most gratifying part was trying something new and taking a risk and seeing it through. I was working in a way I never have before and although the process was slow, it was worth it. And Monica (Kulling) is wonderful and prolific. She has an excitement and talent that is infectious. She is unstoppable! Sydney Smith was born in rural Nova Scotia and graduated with a BFA from the Nova Scotia College of Art & Design in Halifax. He has illustrated multiple children’s books, including the wordless picture book Sidewalk Flowers. Sydney lives in Toronto. According to her website, Monica Kulling “lived the life of a free-range kid” in British Columbia. She studied creative writing at the University of Victoria, and is the author of many books for young readers, including The Tweedles Go Electric and The Tweedles Go Online. Grant and Tillie Go Walking by Monica Kulling, illustrations by Sydney Smith. Groundwood Books, 2015. Previously reviewed – Sidewalk Flowers by JonArno Lawson and Sydney Smith.